The IEEE Student Branch at our campus hosted ISEE-2012 in connection with the visit of the IEEE Education Society President, Dr.Rob Reilly. The plan was to make it a one day event(since most colleges in the state had already reopened and getting students to attend would be hard-or so we thought :D) with Dr.Rob’s keynote address and other talk sessions in the morning, followed by 3 parallel tutorial sessions in the afternoon. Being part of the Branch Executive Committee, and considering the fact that our branch counselor was not available here, it was up to us to publicize and plan the event. We opened registration in the last week of June and for the first 4-5 days the number of registrations was stuck at somewhere less than 20. With most of us busy with placement training and projects, We began wondering if the event would happen at all. On July 1st, some of us went over to College of Engineering, Barton Hill, Trivandrum for an IEEE Hub programme-it also gave us a chance to create awareness and promote our event there. That trip perhaps made a difference-we distributed posters and brochures and these got a lot of people interested in participating in ISEE. In the weeks that followed, the number of registrations slowly rose..100 150 190 230 and finally stood at a whopping 320 registrations! A classmate and myself, were in charge of the Entrepreneurial Workshop session post lunch. Everything-from fixing up slots with the speakers, to getting the venue ready was our job. Three eminent speakers-CEO’s of Artin Dynamics, Innoz(Mobile Search Engine Company) and Start-up village had agreed to come. 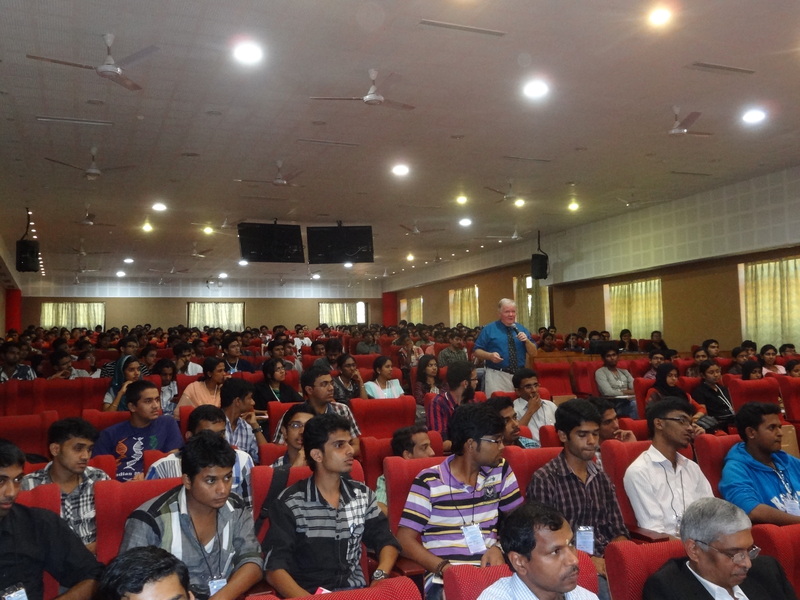 Nearly 70 students had opted to sit for the Entrepreneurial Session, plus a few spot registrations. On the day of the event, 5 of us, WiE members, were assigned the task of managing the registration desks. A friend, who was supposed to do the compering in the afternoon and introduce one of the speakers in the morning session fell ill, and I was given those added duties as well :|. Oh we had to do some lunch serving in the afternoon too. The morning session went off smoothly. Although I couldn’t listen to all the speakers-I got to hear some of Dr.Rob’s Keynote address and one session by one of our seniors as well. Conducting and organizing the entrepreneurial talk sessions was good fun. Most of the students who chose to attend these talks seemed to have a clear idea of either applying for project support at places such as Start up village or starting little business ventures themselves :D. The event concluded by about 5 in the evening and participants were dropped off at the bus depot and railway stations by six. We’d distributed Feedback forms to participants with questions such as-Was the event organised, did you like the tutorial sessions, rate the event on 10 and some space for their suggestions if any. We got feedback ranging from “good”, “well-organized”,”Is this a college or a five-star hotel” to things like “the pappadam served with lunch should’ve been bigger” and “Hey you didn’t serve lime pickle” :P. Still the feedback was by and large very positive and most of the participants seemed pretty happy to have been a part of it(Now you know why I said we did a decent job :D). One of my friends who attended the event put it beautifully-“It had everything that’s expected from a one-day event, Kudos to you guys!” :). Participants all sent back, it was time to tally registrations and settle accounts. All this was done in a couple of hours time and we got back to the hostel-Happy that it had gone off well, but not-so-happy about the fact that college was reopening for the new semester the next day. ISEE has helped us get to know a lot of juniors all the more, maybe it has even helped get to know some classmates better. Our counselor said they had always wanted to organize such an event, but had never been able to do so. Now that we have set the ball rolling, junior batches will hopefully take up the responsibility and come up with more events such as this one. Ahh well, let’s see. So much for now!